Looking for end of year teacher's gifts or teacher appreciation week ideas? These cheap teacher's gifts might be low on cost, but they're high on gratitude. I could practically hear my kid’s teacher rolling her eyes as I contemplated picking one up as an end of year teachers gift. Picking out what to give teachers can be such a challenge. There are 30 kids in the class multiplied by however many years he or she has been teaching. Finding something they can use, which is also somewhat original, can make you scream. Even harder is if you have been assigned to compile a gift from the class. It feels like you’re chasing someone down for their life savings instead of a $5 contribution! What does that leave you when you want to let a teacher know you appreciate the work they’ve done all year? Is there a teacher end of year gift that they will love and actually use? The answer is yes and we’ve rounded up a few to get you started. 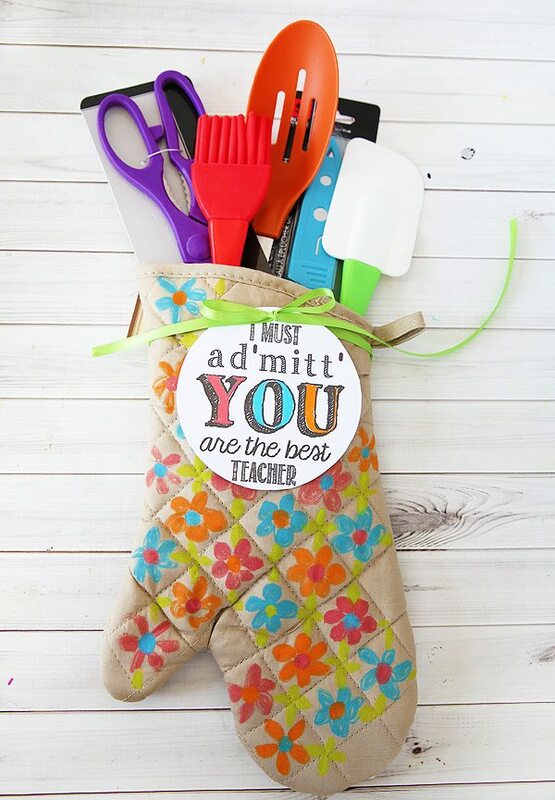 Running short on time to DIY your teacher appreciation this year? You can always use the Amazon gift finder to quickly find the best teacher gifts. Was your kid’s teacher as cool as can be? This is the perfect gift to let them know that. Family Bites put together a great ice cream sundae kit that will help sweeten up their summer. Throw in a gift card to the local ice cream shop to seal the deal. Being a little “punny” is expected when it comes to teacher gifts. This handy gift idea from Alpha Mom is not only cute but also incredibly useful! If you’d like to spice it up a bit more, include a gift card to a kitchen supply or grocery store. You can also check out Amazon to find all sorts of inexpensive kitchen gadgets and you can get them delivered in plenty of time. If your class is joining together for the end of year teacher gift, this gift card bouquet is a great way to use the money collected. Rather than just one gift, this bouquet has a selection of choices that will have the teacher feeling loved all summer long. The flower photos of the kids are a great sentimental touch. You could also include handwritten thank-you notes from each parent to really make this bouquet overflow with gratitude! 4) What S’more Can You Ask for? Summer is a time for firepits, camping, and spending time outdoors. Allow your child’s teacher to have a sweet time this summer by gifting a S’mores kit to them. Driven By Decor found everything needed to craft one at the local dollar store. Liven up the kit by including a variety of flavors in chocolate bars and marshmallows. It doesn’t get much sweeter than that! If anyone deserves to laze on the beach or poolside all day, it is a teacher. After a school year surrounded by children, the only thing they should hear is the ocean waves crashing. A summer relaxation kit is a great class gift to put together with contributions from each student. It’s our favorite DIY teacher gift to put together here at DIY Shareable. Students contribute everything from beach towels to book store gift cards, and teachers come away with everything they need to get away from it all. Did you know that most teachers buy many of their own supplies? In fact, in many school districts, they have less than $100 to spend on classroom supplies for the entire year. You know firsthand how much school supplies cost and how often a teacher needs to loan a pencil, glue, or another classroom need. That $100 goes fast. Help your teachers keep money in their pockets and supplies in their classroom by gifting them a teacher essentials kit. Pack it full of everything they might need in a day and keep in mind that essentials will vary depending on what grades and subjects they teach. Make sure you throw in a candy bar or two – those are totally essential to teacher survival! Roll out the red carpet and make your teacher feel like a star performer by putting together a movie gift box. Pack it full of popcorn, candy, and a gift card to the movie theater or a Redbox. Tater Tots and Jello even has some great printables you can use to dress the gift up and give it the star treatment. Don’t have the time to make this? I found this movie night gift set you can buy and get delivered in plenty of time. And for those super health-conscious teachers out there, here is a sugar-free movie night gift box! Can you imagine not being able to grab a drink or snack when you need one during the day? Welcome to life as a teacher. You can’t exactly walk out on a class full of kids when thirst or hunger strikes! Make sure your teacher is taken care of with a refreshing gift – grab an insulated water bottle and fill it with flavor packs, snacks, and a gift card or two. Juggling Act Mama even included printable gift tags! Plants are a great gift for teachers! The air in a classroom can get pretty stale. If you really want to help them, make sure you choose an air purifying plant like a peace lily to stick in this personalized flower pot from Giggles Galore. The gift card is a great little bonus treat too! The amount of stuff that teachers need to lug back and forth to school is nothing short of ridiculous – papers, grade books, laptops, supplies, lunch, drinks, books, and so on. You might be tempted to supply a pack mule or wheelbarrow to lighten their load but this personalized tote bag idea from So Much Better With Age will probably do just fine and be much appreciated! Fill it with snacks and school supplies before delivering! Themed gifts can be very hit or miss. Luckily this one is so cute it can only be a hit. Plus who doesn’t like all things orange flavored – so refreshing and rejuvenating for summer! Shaken Together Life has put together an orange themed gift with everything from tumblers to tic-tacs for a deserving teacher in your life. If your kids have ever driven you to drink, imagine quadrupling the number of kids you have and the hours you spend with them! Let that special teacher know you understand with a comical After School Snack wine glass. While bringing alcohol on campus is a big no-no, the personalized wine glass is a definite yes on all accounts! A winning teacher is hard to come by and should be handsomely rewarded. A lotto themed gift is perfect and might just fund that teacher’s summer vacation or even their retirement. Include candy, raffle tickets, or other winning themed gifts to really make them feel like they’ve hit the jackpot! Take a popular baby shower idea and make it work for your favorite teacher! In addition to classroom supplies, many teachers are desperate for books to fill out their classroom library. If you’re in charge of the end of year teachers gift from the group, have everyone bring their kid’s favorite book from the past school year and include a note written inside the cover about why they enjoyed it. This is surely a gift that will get appreciated for years to come! Ask any teacher and they will surely tell you that their planner is the one item they absolutely cannot live without. Stacey from Soccer Mom Blog has crafted the Ultimate Planner that will be without a doubt the most useful gift any teacher can receive. Include a gift card to a local classroom supply store or the Teachers Pay Teachers website to really show how much you care! Make no mistake, the teachers in your lives are as happy as your students that summer is finally here! Use these great ideas to let them know just how much you’ve appreciated all of their hard work this year. Oh and remember how hard it is to get money for a class gift? We’ve discovered that creating a sign-up sheet online to contribute individual items to a gift always gets a better response and usually results in both higher quality AND quantity of gifts for the teacher! Who knew? Now that we’ve shared our great ideas with you, don’t be stingy! Come back and let us know what great teacher gifts you came up with. 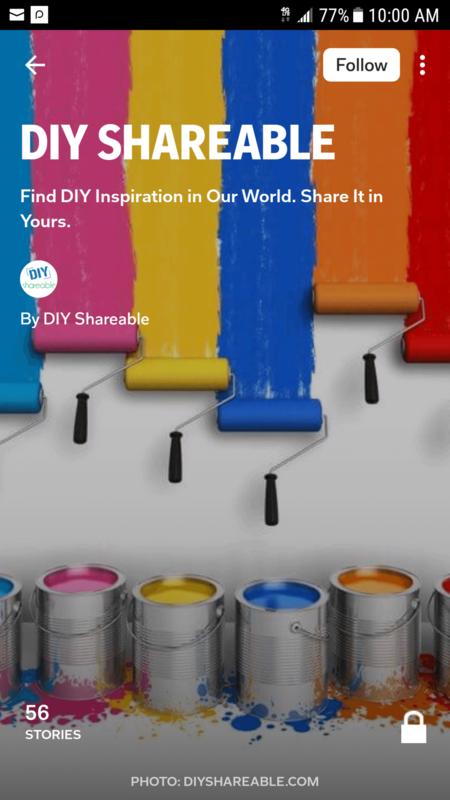 Share pictures with us here at DIY Shareable and make sure to share this article with friends too!